Last week, NPR reporter Hansi Lo Wang visited us at “the den”, aka our practice space in Chinatown, to work on a story featuring…us! We were in the throws of rehearsing for the Lunar New Year so he got to see first-hand all the insanity. 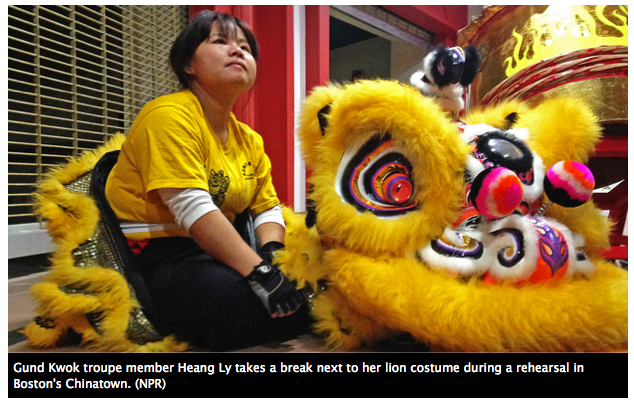 Lion and dragon dancers are set to parade down Chinatown streets around the country again with the Friday start of another Lunar New Year. You’ve probably seen these traditional dance troupes in Lunar New Year celebrations, performing gymnastic feats under papier-mache lion’s heads, and swaying cloth dragons aloft on poles – all to the pounding rhythms of cymbals and drums amidst a flurry of crimson firecrackers.